When I clicked to order it said Ruby Red Glitter. Um, that’s more of a burnt orange. It’s not bad or anything, but you know how you kind of expect something to be a certain way and get a little deflated when it has no resemblance to your mental image? I’m here in KS, the home of Oz, and when you say Ruby Red I see bright slippers in my mind immediately. So you can imagine my surprise when I pulled out a more pumpkin variety of Ruby Red. The package sure says Ruby Red Orange (really?! ), but I swear it didn’t when I clicked on it. Since it’s glitter the close up had oranges, reds, and slight whiteness as the light reflected, so I didn’t think anything of those orange tones. Doh. 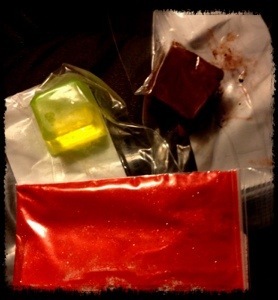 The two pigment soap squares are lemon lime and a simple brown. I’m hoping that a little bit of this dark brown will work better for the pancake soaps. (I didn’t post a final pic of that because I needed to work on the color anyway, so I cut all of the components up and enclosed them for the donation box for OK.) I think a rich brown should give them a deeper “fried” or wheat coloring instead of the odd diluted chocolate milk color I managed to get. Lol. The lemon lime was a free sample, so I don’t have any specific plans for it. I just want to make some wildly eye catching soaps. *grin* I got neon pink powder pigment last time that I haven’t experimented with yet, so this will be the perfect time to make some complimentary neon soaps. I couldn’t get the picture to do the lemon lime’s vibrancy justice, but I tried for half an hour. It is oddly beautiful. Since I love the sample I bought last time of the silver sample packets I got a hundred of them while they were on sale, so I will have enough for September’s Breast Cancer event. I’ll fill them with a sample of my best lotions and they’ll go in the swag bags for the first hundred people. I also stocked up on single ounce jars so I can sell trials of the lotions at the event (and the jars are massively easier than those bullet bottles that I used to use). So I’m off to go collect more fonts to experiment with for product labels (darn it Pinterest!!). I think I have developed a small addiction to collecting fonts. *cracking up* It’s a nerdy fixation, but at least it’s not hurtful I guess. If an obsession doesn’t hurt anyone other than eating up free space, then it’s totally fine, right? Mawahahaha! Posted in Soaps and tagged handmade, soap. Bookmark the permalink.